Anti-aging Secrets From the "Oldest Yoga Teacher"
You may already know that practicing yoga is good for your health, but did you know that it can even be considered a real-life fountain of youth? Bernice Bates of St. Petersburg, Florida is well aware of its many benefits after being entered into the Guinness Book of World Records at the end of 2011 where she was awarded the title of “Oldest Yoga Teacher.” For over a half century, Bates, 92 years young, has practiced yoga exemplifying the fact that losing range of motion in your older years doesn’t have to happen. It isn’t a normal part of aging, but something that happens with inactivity. Yoga is not just an excellent form of exercise but it will also help battle many annoying signs of aging. As we get older we begin to lose muscle at a rapid pace. Studies have found that resistance exercise training can reverse much of this age-related muscle loss. Yoga is a resistance exercise that plays a key role in keeping muscles strong and flexible. An increase in muscle generally means a boost in metabolism. This is good news for weight management. You may have noticed that those who practice yoga often have a better complexion than those who don’t. This is because yoga teaches the importance of proper breathing. When we breathe correctly oxygen can be delivered to the bloodstream efficiently, nourishing every cell. The act of focused breathing assists the body in ridding itself of toxic buildup while promoting relaxation, thus reducing the appearance of fine lines and wrinkles. Menopause hits many women like a load of bricks causing a host of symptoms that can make one feel pretty old. From hot flashes to insomnia and roller coaster hormones, the signs of menopause can begin as early as 30 years of age and last well into the 50’s. Practicing yoga helps to eliminate some of these annoying symptoms as it works to restore balance to the body while elevating moods. 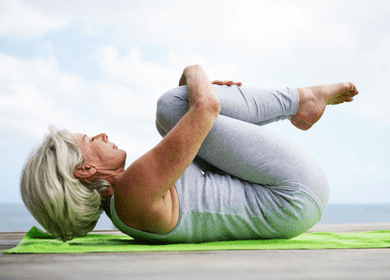 Inactivity combined with aging can result in a sore and inflexible back. Having a sore back can significantly reduce one’s quality of life. Yoga serves to elongate, stretch and strengthen the spine. This increases flexibility and decreases inflammation and pain. Yoga increases mindfulness and the ability to live in the present, which can positively transform our outlook and chase away depression. An optimistic attitude has been shown to provide substantial physical and mental health benefits. Happy people generally live longer than unhappy people and look younger, as well. Do you practice yoga? What benefits have you seen? Previous article5 Ways to Power Through Your Midday Slump! Hey Buddy!, I found this information for you: "Anti-aging Secrets From the “Oldest Yoga Teacher”". Here is the website link: https://www.thealternativedaily.com/anti-aging-secrets-from-the-oldest-yoga-teacher/. Thank you.